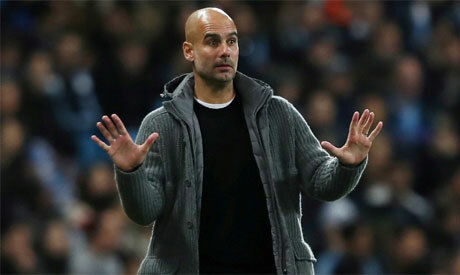 Manchester City manager Pep Guardiola raised the prospect Friday of soccer authorities punishing the Premier League champions over attempts to circumvent financial fair play rules. ``If there's something wrong we'll be punished,'' Guardiola said at a news conference ahead of Sunday's derby against Manchester United. City, which has been owned by Abu Dhabi's Sheikh Mansour for a decade, was punished by UEFA in 2014 for breaching the ``Financial Fair Play'' program. The settlement agreement eventually saw the club only forfeit 20 million euros ($23 million) in Champions League prize money. UEFA this week has not said how aware it was of City's schemes, reported by German magazine Der Spiegel, to hide expenses and evade monitoring of spending on players. Der Spiegel showed how the team's holding company _ state-backed Abu Dhabi United Group _ sent cash to a shell vehicle which was created to supposedly buy the right to use players' images in marketing campaigns. This helped turn almost 30 million euros ($34 million) into revenue instead of a cost, for the purpose of UEFA's investigation of club accounts as the club tried to avoid being banned from European competitions for overspending. While City said it ``will not be providing any comment on out of context materials,'' Guardiola was more open to discussing information related to the Football Leaks investigation. Real Madrid was revealed to be working with consultants on a 16-team Super League to kick off in 2021, effectively replacing the Champions League and outside the control of UEFA.